You are here: Home / *Articles of the Bound* / SEIU to Support Obama 2012 – But for What Price? The Service Employees International Union has just endorsed President Barack Obama for re-election, reports the Communist Party USA‘s newspaper, People’s World. This is the third large union to get behind the Obama machine as it gears up for the 2012 campaign. Taking into account the first two unions to announce their support, the National Education Association and the United Food and Commercial Workers, an estimated six million union members are now purported to back the president. Both the SEIU and UFCW are member-unions of the Change To Win union. The leadership of the mega-union is made up primarily of SEIU and UFCW leaders. It is worth noting that Change To Win was represented at a September 2008 rally in Michigan demanding the State Legislature enact a two-year foreclosure moratorium bill. The rally was sponsored by Moratorium NOW! which is controlled by the Workers World Party. The vote was overwhelming, but totals were unavailable, an SEIU spokesman said… The endorsement was bottom up, he added. He said locals started calling the international office months ago, seeking comparisons between Obama and stands by several of the Republican hopefuls now campaigning nationwide. The locals said members were pro-Obama but wanted more compare-and-contrast data. Once they got it, they relayed their own pro-Obama stands to the board. “President Obama is the only candidate for president who shares our vision of America as a land of opportunity for everyone,” Henry said on the union’s blog in announcing the endorsement. “We need a leader willing to fight for the needs of the 99 percent, and stand with hard-working families to say that the world’s wealthiest corporations must pay their fair share. “Our economy and democracy have been taken over by the wealthiest one percent,” she continued. “These bankers and CEOs use their wealth and excessive political influence to treat our state and federal governments like their personal cash drawer – spending lavishly on elections and then pressuring legislators to give them even more instead of creating jobs. It shows in the results. Henry is adamant that the SEIU is squarely behind the president and will fight tooth and nail to see him re-elected. Since 2009, Mary K. Henry* has made 14 visits to the White House including 3 meetings with the President. And immediate past president Andy Stern visited at least three times with the president and once with Joe Biden in 2009. Does this 2.1 million member strong union hold any sway over the agenda coming out of the White House today? 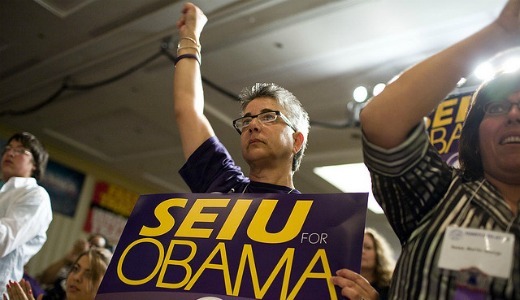 Or are the SEIU’s meetings at the White House and their strongly espoused support for Obama’s re-election campaign purely coincidental? And is this “99% agenda” what is needed to restore America – or is it the exact opposite? *Only the initial of the middle name is given, however it is more than likely that this is the same Mary Kay Henry, president of SEIU.